James T. Aris D.M.D., M.A.G.D., P.C. Dr. James T. Aris and the professional team of Wilton Center Family Dentistry are dedicated to creating a partnership with every patient they treat to help them achieve and maintain their optimal dental health. During his 27 years practicing dentistry, Dr. Aris has accepted the charge to keep abreast of advances in the field for the benefit of his patients and the betterment of dentistry. His state-of-the-art CAD/CAM 3-D system allows him to create crowns, inlays, onlays and veneers on-site in just one day. Wilton Center Family Dentistry also uses A-dec hospital-grade sterilization, the latest Dexis digital x-rays, and will be introducing a Zeiss microscope. Dr. Aris’ extraordinary commitment to education allows him to perform sophisticated procedures including full-mouth reconstructions, root canals, implants and bone grafts. He’s among the top one percent of general dentists in this country who have earned a Mastership from the Academy of General Dentistry. In 2014, the Dawson Academy, one of the leading international organizations for post-graduate dental education, announced that Dr. Aris achieved Scholar of the Dawson Academy. The Dawson Academy is where dentists come to gain a better understanding of not only teeth, but also the muscles and systems that control them. A believer in life-long learning, Dr. Aris just completed NYU Linhart Continuing Dental Education’s Advanced Full-Mouth Reconstruction yearlong course. Dr. Aris is recognized as a Leading Physician of the World and Top General and Cosmetic Dentist by the International Association of Dentists. MASTERSHIP: Dr. James T. Aris, DMD, MAGD, in earning his Mastership Award from the Academy of General Dentistry needed to complete 1,100 hours on continuing dental education post-doctorate, of which 400 were required to be hands- on (demonstrating a mastery of the skills and techniques being taught). He completed 1,355 hours of which 511 were hands-on. The Academy of General Dentistry requires that the courses be distributed between 15 disciplines: Basic Science; Endodontics; Myofascial Pain/Occlusion; Operative (Restorative) Dentistry; Oral and Maxillofacial Surgery; Orthodontics; Pediatric Dentistry; Periodontics; Practice Management and Human Resources; Prosthodontics/Fixed; Prosthodontics/ Removable; Implants; Oral Medicine/Oral Diagnosis/Oral Pathology; Special Patient Care; and Esthetics/Cosmetic Dentistry. Dr. Aris attended continuing dental education courses throughout the United States including University of Pennsylvania, NYU, Tufts and The Dawson Academy, and courses offered through the American Dental Association and the Connecticut State Dental Association. DR. JAMES T. ARIS is a graduate of the University of Pennsylvania School of Dental Medicine where he served as president of the Endodontics Club, and member of the Tri-Beta Biological Honor Society. Since finishing dental school, he has logged over 1,500 hours of continuing education. Dr. Aris’ extraordinary commitment to education allows him to perform sophisticated procedures including full-mouth reconstructions, root canals, implants and bone grafts. He’s among the top one percent of general dentists in this country who have earned a Mastership from the Academy of General Dentistry. “Patients come first” at his practice he says. “That’s what drives us to seek out world-class educators to bring back world-class dental knowledge for the benefit of our patients.” Dr. Aris and his team offer compassionate care, and are determined to make all patients feel comfortable from the minute they walk into the inviting reception area. This is especially important, he feels, for younger patients. “Attitudes and habits established at an early age are critical in maintaining good oral health for life,” stresses Dr. Aris. In addition to his Mastership Award, Dr. Aris was named Scholar of the Dawson Academy, where dentist come together to gain a better understanding of not only teeth, but also the muscles and systems that control them. Dr. Aris recently completed an intensive one-year course on Advanced Full-Mouth Reconstruction at NYU Linhart Continuing Dental Education, and is recognized as a Leading Physician of the World and Top General & Cosmetic Dentist. 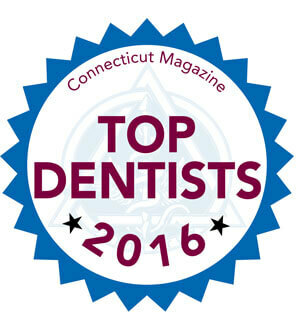 Furthermore, Dr. Aris was recognized in Connecticut Magazine (August 2016 issue) as a 2016 Top Dentist.